The Garmin 60CSx is one of the most popular outdoor GPS units. 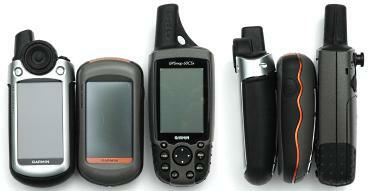 It is a design that has been refined over a number of years and is the definitive outdoor GPS in the Garmin lineup. The 60CSx is nearing the end of production, but at the time of writing is still available. The new GPSMAP 62s is the successor, but the 60CSx is still a good option. 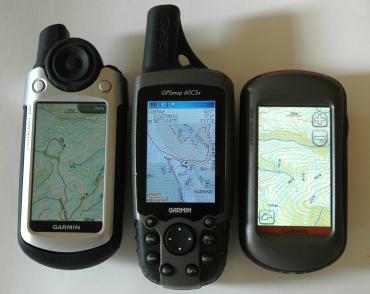 The photo below shows the 60CSx compared with two other high-end mapping units: a Colorado (left) and Oregon (centre). The 60CSx is a little bulkier than the other two models. The 60CSx is the heaviest of the three at 213g - the Oregon is the lightest at 192g. The unit feels secure to hold and the rubber grips at the bottom make it easy to use one-handed. The device is controlled using a rocker button to indicate direction and 8 function buttons. IN/OUT zoom the map and altimeter views in and out. FIND takes you to the location search pages. MARK creates a new waypoint. MENU, ENTR, and QUIT are used together with the rocker to navigate the unit's menus. PAGE moves you between the units different screens, map, altimeter, setup menu, trip and so on. The back of the unit is covered by a hard detachable battery cover. 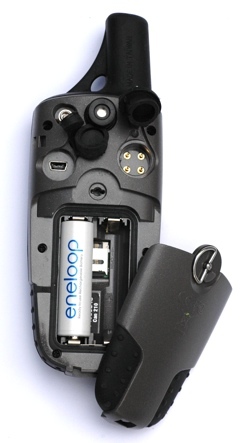 Rotating the metal clip releases the cover, for changing batteries. The slot for the microSD data card is under the batteries. The retaining clip for the microSD is not especially secure. If the clip comes open the data card can drop out. Also on the back is a 4-pin Garmin serial connector, USB connector and MCX connector for an external antenna. Rubber covers protect the connectors. The external antenna connector provides the option of using the unit in a vehcile or boat where there is no clear view of the sky. There is a connection point for a lanyard on the top-left near the antenna and USB ports. Using the metal clip on the battery cover for a lanyard is not a good idea as it can pull the cover open and the GPS falls off. The power button is on the top of the unit. To turn the power on/off hold the button down for several seconds. Pressing the power button briefly cycles through the backlight brightness settings. Battery life is better than either the Oregon or Colorado. The Garmin manual says up to 18 hrs. 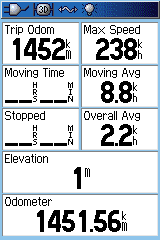 With 2500 mAh NiMH batteries I was getting 12-16 hrs of reasonably heavy use. How much you use the backlight, redraw the maps and have the compass turned on etc will affect the life. If you're using NiMH batteries, you should take a set of batteries per day if you plan on having the unit on continuously. The 60CSx uses a high-sensitivity GPS chipset. Unscientific tests under challenging conditions gave similar results for the 60CSx compared with the Oregon and Colorado. Others have reported the Oregon receiver isn't as good, but this didn't seem to be the case. The time to the first position fix was similar to the other units. The receiver really is extremely sensitive. You can expect it to work in all but the most challenging situations. You can get a fix under dense canopy, amongst high-rise buildings, in a car and often inside buildings. For use in the car, there is a car kit with a suction windscreen-mount and a special lighter power cable that plugs into the 4-pin port on the unit. The car mount is not as easy to use as the rail mount on the Oregon or Colorado. The 60CSx screen is 38mm across and 56mm tall. The Oregon and Colorado screens are 38mm x 63mm. Physically, the difference is not great, but the Oregon and Colorado have a much higher pixel density. The Oregon screen has two and a half times as many pixels in its display. In addition the 60CSx display can display only 256 unique colours whereas the Oregon and Colorado can display many more (the specs don't say how many). This difference is hard to convey on a computer screen. The first image below is a screen capture from an Oregon. The second is from a 60CSx and has been enlarged to reflect the relative physical size of the screens on the two units. As you can see, the Oregon/Colorado maps are clearer and you can see two and a half times as much map at a given zoom level. However, don't let that put you off the 60CSx as the mapping is quite usable. The Oregon screen has the brightest backlight of the three units, as you can see in the photo below, making it the easiest to read in conditions where the backlight is significant. However, in sunlight and bright overcast, the readability is reversed - the 60CSx is the easiest to see, and the Oregon the least. The 60CSx screen is quite sensitive to viewing angle. Tilting it slightly can make a big difference to readability. For heavy use, a stick-on screen protector wouldn't be a bad idea. The user-interface is easy to use and learn. The 8 buttons and rocker pad give you access to the GPS functions. 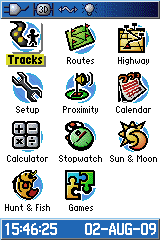 The functions are organised into a series of pages, main menu, map, trip computer, compass etc. About 15 pages in total. These pages are accessed either from the main menu, or in a sequence of pages that are displayed when you push the PAGE button. The Trip screen shows comprehensive information on your position and travels. The data displayed on each position on the screen can be customised. You can select the value to be shown from a large list of data like speed, distance, position etc. There is also a big print option with fewer values. This is greta for use in a vehicle. On each page further functions for that page are accessed by pressing the MENU button. There are a great many options allowing you to customise the device just the way that you want it. The above examples show the options for customising the map. 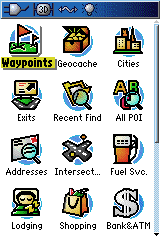 Almost every aspect of the map display can be setup the way that you want. Text entry is servicable, if a little cumbersome. 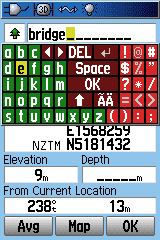 When you need to enter text for a search or a waypoint etc, a keypad pops up on the screen. To enter text you move the yellow highlight to the next letter or number to enter, using the rocker pad. Then enter the key with the ENTR button. Once your entry is complete you select the "OK" button on the keypad. The full-screen touch keypad on the Oregon is much faster to use. On the other hand, unless you capture a lot of waypoints, does it matter that much? There are a wide variety of maps for this unit. For outdoor activities, topo maps, such as our MapToaster Mobile/NZ provide detailed topographical mapping. The 60CSx also supports shortest-path street navigation with suitable maps. Garmin provides City Navigator maps for this. For marine use there are the Garmin BlueChart series. To use multiple map sets you can change microSD cards. If you have CD/DVD versions of the maps, composite maps sets can be loaded onto a single card using Garmin MapSource software. The FIND button takes you to the screen that lets you search waypoints, placenames, addresses and points of interest (POI). When you press the FIND button you see the screen below. The 60CSx has excellent Find tools. Select a category icon, e.g. "Geographic Points". The GPS will display all the points in the selected category in a list, starting with those closest to you. This can be useful for finding, say, the nearest petrol station or hut or ATM. To search for a particular item, press the MENU button. There are two find modes. Find by Name will locate names that start with the text that you enter, throughout the entire name database on the GPS. This is a very powerful tool as it allows you to position the map view anywhere in the map database. This very useful type of search is not available on the Oregon/Colorado GPS. Find Nearest Containing searches nearby for names that contain the text you entered, anywhere in the name. 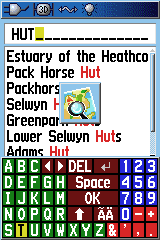 You can use the Change Reference menu item to select a new location to search near to - very handy for finding POI and locations at your destination. Once you have found what you are looking for in the fnd list, use the rocker pad to select the item and press the ENTR button. You will see the scren below. This contains addition information about the location, such as it's locality name and possibly a street address or phone number. The 60CSx has a special find category for geocaches, but provides nothing like the paperless geocaching facilities found in the Oregon. You can connect the computer using either a USB or serial cable. Software that supports the Garmin communications protocol can upload or download tracks, waypoints and routes. For long track logs, USB is preferred as it is far faster. Realtime tracking is also available. With a serial cable both Garmin PVT and NMEA formats are supported. The USB cable only supports PVT mode. The 60CSx is a good choice if you want both a standalone GPS and a GPS that can supply real-time positions to anther computer. 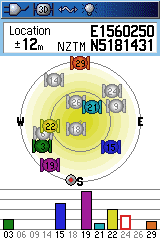 The Garmin PVT format is widely supported and NMEA is almost universal. The USB has a second mode called USB Mass Storage. 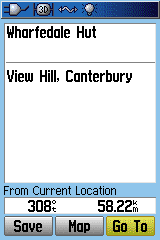 When this is enabled, in the GPS Setup page, the data card in the microSD slot appears as a drive letter on your computer. You can use this to transfer track logs that have been saved on the data card to your PC. 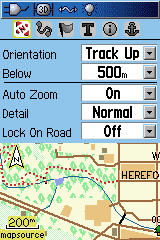 You can also use Garmin MapSource software to transfer maps to the unit. This is a very well proven and robust GPS whose design and features have been refined over a number of years. The user interface is easy to use, though entering text and numbers is much easier on the Oregon's touch screen. The search has a very useful Find by Name mode that is missing on the Oregon. Of the Garmin high-end mapping GPS units it has the edge for screen visibility in bright light. But, compared to the Oregon and Colorado the screen is smaller, and has a lower pixel density so the maps don't look as good and you can't see as much as one time. The User Manual is available for download from Garmin. If you have any comments, or there's anything you'd like to know about the 60CSx I haven't covered, and I'll add it (BTW, we don't sell GPS units). The 60CSx test unit had version 4.00 firmware and GPS software version 2.90s. Copyright © 2009 Integrated Mapping Ltd. All Rights Reserved. This article may not be reproduced without permission. 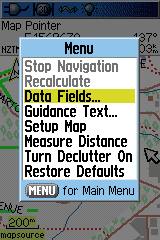 Now available - MapToaster Mobile/NZ provides NZ topo maps for your Garmin outdoor mapping GPS. 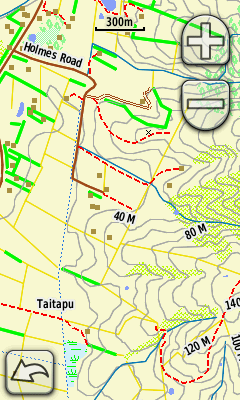 This is a companion for MapToaster Topo/NZ for your computer. Check out our review of the Garmin GPSMAP 62s GPS. Check out our review of the Garmin Oregon 300 & 550 GPS. And our review of the Garmin Colorado 300 GPS. MapToaster Topo/NZ was developed in Christchurch by Integrated Mapping The company, which was established in 1992, specialises in building mapping, GIS and GPS software and is 100% New Zealand owned..